Tibetan regions of the People’s Republic of China are experiencing a level of unrest that hasn’t been seen for twenty years. This is a major public order crisis for the People’s Republic of China. The genie of Tibetan insurrection has to get put back in the bottle before dissidents get emboldened and the PRC’s rule over a quarter of its landmass starts to look less like occupation and more like counterinsurgency. Holding on to political power is the one task the Chinese Communist Party is purpose built to accomplish. One of its critical arenas has been Tibet, which has endured invasion, occupation, the deaths of perhaps a million of its citizens and a brutal, fifty-year effort to fragment Tibet's political, ethnic, and cultural identity. Early reports on the violence trotted out the “ethnic powder keg” line, linking the disturbances to the Chinese beating a couple of monks in Lhasa, then reaping the whirlwind of outrage. Senator Obama misses the significance of March 10, 1959; in addition to being when His Holiness the Dalai Lama fled into exile, it was when Tibetans across Tibet rose up against the Chinese occupation of their country. So while we appreciate Senator Obama’s support for Tibetan autonomy, we would be much happier if he recognized and supported what Tibetans are literally dying for in the streets: independence. I have to admit that I wasn’t aware that March 10 is officially Tibetan National Uprising Day, usually commemorated by remarks by the Dalai Lama and demonstrations protesting the Chinese occupation. The day seems to be silent and peacefull, even boring. Until 6 o´clock. then 100s of Tibetans gather together on the Bakhor Square. They form a strong, silent, peacefull circle around the police who keep the middle of the square open. Soon they call for backup. Undercoveragents, not so difficult to recognize film the whole happening. Especially the faces. This is one method to create fear. Suddenly there is panic. 6 or 7 monks are arrested and driven away. Which brings us to the imposingly named Tibetan People’s Uprising Movement. The signatories to this declaration are the Tibetan Youth Congress, Tibetan Women’s Association, Gu-Chu-Sum Movement of Tibet, National Democratic Party of Tibet, and Students for a Free Tibet, India. I think one can also take it as a sign of the movement’s importance that their website, which is certainly blocked inside China, is apparently being disrupted at its source by the Chinese. The links I’ve provided above get you to the archived pages, but I’ve been unable to access the home page, getting the “This page cannot be displayed” error message. If the Chinese really are hacking the TPUM site, or even just launching a denial-of-service attack, that will provide ample food for thought for people concerned about Chinese cyber warfare intentions. James Fallows reports that inside China, main foreign media websites aren’t blocked, but any page with the words Tibet are. SFT reports that all Youtube is blocked, a recognition of the utility of video in breaking down censorship (no keywords to catch) and the extensive use of Youtube by emigre Tibetans. I have, from the very beginning, supported the idea that China should be granted the opportunity to host the Olympic Games. Since such international sporting events, and especially the Olympics, uphold the principles of freedom of speech, freedom of expression, equality and friendship, China should proveherself a good host by providing these freedoms. Therefore, besides sending their athletes, the international community should remind the Chinese government of these issues. I have come to know that many parliaments, individuals and non-governmental organisations around the globe are undertaking a number of activities in view of the opportunity that exists for China to make a positive change. I admire their sincerity. I would like to state emphatically that it will be very important to observe the period following the conclusion of the Games. The Olympic Games no doubt will greatly impact the minds of the Chinese people. The world should, therefore, explore ways of investing their collective energies in producing a continuous positive change inside China even after the Olympics have come to an end. The possibility that the current Tibetan unrest will dim the luster of the Beijing Olympics is already making Chinese go nuts on the message boards (see Rebecca Mackinnon here), eliciting the extreme Chinese chauvinism and defensiveness that makes any kind of rapprochement with the Tibetan government in exile almost impossible. Assuming that TPUM has thought this thing through, the conclusion would be that they are consciously trying to elicit Chinese over-reaction, exacerbate the crackdown, and alienate more and more Tibetans from the idea of accommodation with the PRC. An interesting idea, except it hasn’t worked in Gaza, even with sub rosa aid from Iran. With the Tibet independence forces actively opposed by India and the United States and just about every other government I can think of, I wouldn’t think that such an approach would succeed in Tibet. And it would also involve abandoning the moral high ground that the Dalai Lama has assiduously cultivated for fifty years, turning an esoteric religion and feckless ruling class into beacons of righteousness and hope. 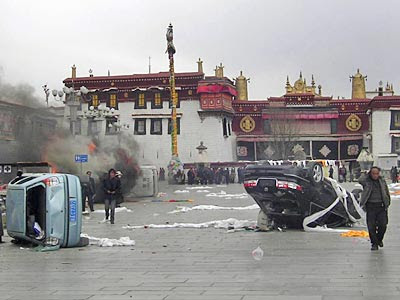 A posting on SFT makes a tortured attempt to reconcile the looting of shops and attacks on Han Chinese in Lhasa with principles of non-violence. 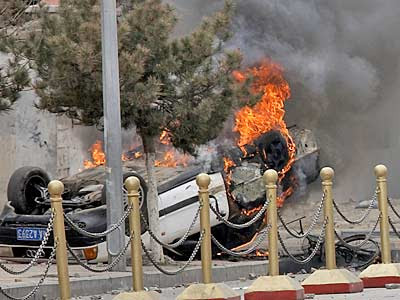 But there’s something about an overturned burning car that says “angry rioter” instead of “nonviolent martyr”, and I’m sure that the PRC will be able to come up with some atrocity photos of some beaten up, burned, and/or killed Han shopkeepers if they need to. Here in China the BBC and CNN are heavily censored today - most stories on Tibet are being blanked out - but some are getting through - especially speeches by President Wen blaming the Dalai Lama for the unrest. Sadly, the Chinese people are getting a very one-sided account of the situation in the Chinese language media. They are so misinformed that I can hardly blame them - however, I can blame them for not understanding that they are being brainwashed by their government. A Tibetan intifada with the 'Dalai Clique' would not play in the West. Westerners have too idealized of a perception of Buddhism, Buddhists, and the Dalai Lama. At the same time, China is becoming more and more our boogey-man. Look for the separatists to receive 'moral' support from the Western media and politicians for a long time before we ever begin making associations between Muslim fundamentalists and Buddhism. It doesnt matter if tibet was at all a part of china in the past or not. If you see the indian history you will figure out that at some point of time or other, the indian territory extended to pakistan and afganistan in the north and far to the south east asia. It would be stupid if today India says that a particular territory belongs to it since it has been a part of India in the past. What matters is present, and at this point in time there is a tibetian unrest, wherein people are not willing to be a part of the commies. There is oppression and human rights violation. Let the world impose sanctions on china to allow the peace loving buddhists lead a free life. It is an irony that an athiest communist nation is determining the religious and spiritual policies of Tibet. Do not crush centuries old culture in the name of communist growth which certainly is going to be ephemeral. I hope the commies atleast allow proper information to vent out of tibet. It's very interesting that India--a primary supporter and host of the Dalai Lama--is such an ardent champion of Tibet. Yet this same India has many nations struggling for independence within its own borders. The Indian regime and its military have brutally occupied these nations like Kashmir, Assam, and Khalistan for decades. But the the "Free World" turns a blind eye to this occupation because the self-styled World's Largest Democracy of India is an ally of the West. Just as Israel--where a real Intifada is happening--is given a free pass, so too is India. That's Liberal Democracy and Freedom for you. Also, Dr. Sultan and the sanctuary providers are and were able to look truth squarely in the face, without retreating to the comfortable fantasy of denial, and/or of repression of difficult thoughts and emotions. Salute. Very interesting article! Thanks so much for posting, it made me think a lot.